If you are looking for adventure, why not try the activity that made Sanibel famous. Shelling! Check your tide chart for the lowest tide possible, dig out your flashlight and set your alarm for a midnight stroll on the beach. Repeatedly recognized as one of the top shelling beaches of the world; visitors come from all over the globe to this Sheller’s paradise to search the beaches of Sanibel. Sanibel Island lies east west in the Gulf of Mexico, thus the currents in the water actually push multitudes of shells to the beaches! The result is that Sanibel is home to more than 400 varieties of shells! Some of the shells you can expect to find are: Conch, Junonia, Lightning, Whelk, Cockle, Scallops, Murex, Tulip, Olive, and Coquina. Bring along a bucket or a net bag and scoop. Learn to do the “Sanibel Stoop”! The best time to go shelling is at low tide. Never take any live shells! This includes sea urchins, sea stars (starfish) and sanddollars. Live shelling is prohibited and the $500 fine enforced! 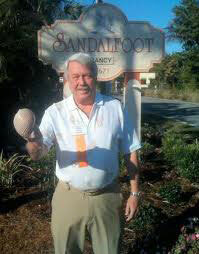 Harlan Wittkopf, Conchologist and author along with his wife, Jeanne have enjoyed staying at Sandalfoot for many years. His inspiration for writing the books about our treasured shells of the sea came from years of shelling on the beaches of Sanibel Island. Harlan and Jeanne come to Sandalfoot for several weeks each year and if you are lucky enough to be here when he is, he’ll autograph his book for you. Harlan finds rare Giant Atlantic Tun (Tonna Galea) on Sandalfoot shores! Want to know more about the shells you found? 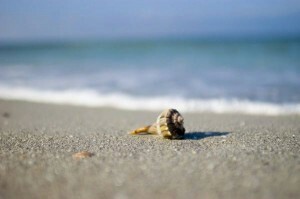 Our friends at www.iLoveShelling.com have the ultimate shell identification chart.